1. Print the book out. Done! Look how gigantic big it is. I love it. 2. Let the gigantic book sit a bit. I really enjoy Stephen King’s book On Writing (except the grammar bit because he makes me feel like a nincompoop). He recommends that you write the first draft “with the door shut”. There is just you and your story. No input from anyone. When you are done with your first draft, you let the book “rest…a minimum of six weeks.” Then you take the book out and read it, ideally in one sitting, and work on fixing the dumb basic mistakes and the enormous plot holes. That’s what you do in the front of your brain. In the back of your brain you are looking for theme, character development, and how to make the story coherent. You take notes on all of this as you read. When you have read all your glorious words, you go back and make the revisions you noted. Draft two will be done at that point, and you open the door, meaning it will be time to get those friends and family who asked to read my book to read my book. I’m hoping it will be my Halloween present to everyone. 3. Finalize who my readers will be. Reader one is my mom for sure. She was an English teacher and loves books as much as I do so she’s a double whammy reader. She’ll find my glaring grammar and verb tense errors, but also be able to tell me where the plot goes astray. I probably won’t let anyone else read it until I get it back from her with a stamp of approval. She reads fast, so even if it’s a brick, it won’t take much of her life away. Then it will probably go to 2 or 3 other people. My husband for sure, but I’m not certain who the others are. I’ll spend the next six weeks feeling people out. If they are still interested in my project when I’m ready for them, I’ll hand them a copy. 5. Find an agent. I want to at least try for conventional publishing of this book, and everyone I’ve talked to who has any connection to the publishing world says the only way to do this is through an agent. So, I’m going to get a Writer’s Digest. I’m going to surf the web. I’m going to read blogs. I’m going to get coworkers and friends to introduce me to their coworkers and friends who have published or who know someone who published. I’m going to work my network and my network’s network. 6. Figure out what genre this thing is. I think I need that to find an agent. 7. Develop my elevator pitch. When someone asks me what my book is about I sound like a bumbling idiot. I want to be able to tell someone in less than a minute a tidbit that will excite them about my story. Also helpful in the agent hunt. 8. Put together a CV and letter of introduction to agents. For fiction, I have a pretty pathetic track record, but I am published in my career field. I have a book chapter out there, journal articles, and scientific papers. I need to figure out how to tell a my story of techie-geek turned fiction-maven in a coherent way. 9. Fill out dumb bureaucratic paperwork, because I can’t go any farther in this without approval from my job. I can’t find an agent. I can’t publish. I can’t tie my real identity to afthead until I get work’s blessing. (This will surprise you, but I don’t want to publish my book as Afthead. I’m not Prince or Madonna.) For those of you working in real jobs it probably behooves you to find out if your company has any conflict of interest or copyright restrictions that might be a problem if you ever want to publish. With that, my string of book blogs is complete! Tomorrow it’s back to more normal stuff. I’ve got a yarn lady obituary to write, a work conflict to chat about, and a post on web statistics in my drafts. 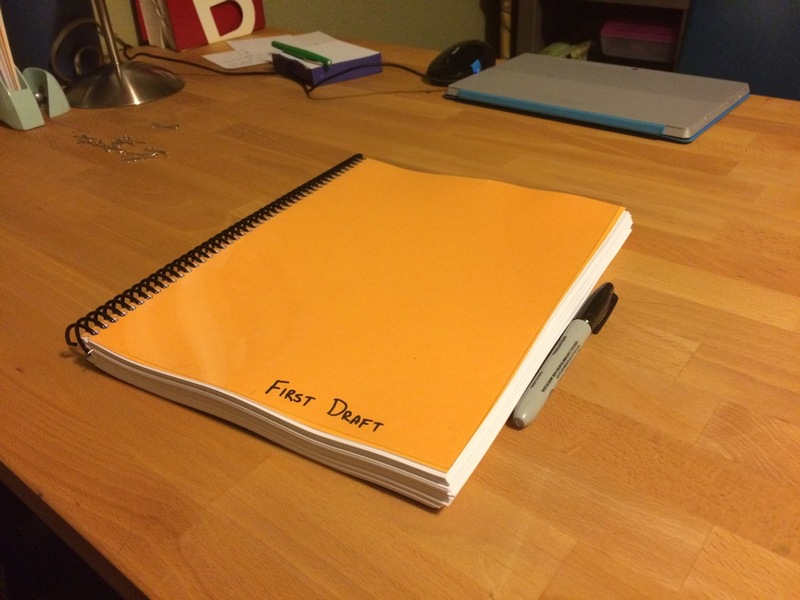 So much good stuff that I can dive into now that my orange covered “First Draft” is tucked away and aging. I love it so much. Can’t wait to see how this works out for you. I get a panic attack just looking at everything you are doing. Go for it! I managed to avoid the panic attack until I started reading about how to find an agent. Gak! I’m just focusing on the 9 point list for now and checking the things off I can do. Thanks! I’m going post something each weekend about where things are headed. Love getting a peek at your thought process! I wish I could give you some guidance on finding an agent – I queried agents and publishers open to unagented work at the same time, and had more luck with the latter. So this is fascinating. How did you query anyone? Did you call or write them an email? I’d love to know how you even got started! How did you find agents versus publishers to query? Thanks!!! I had a few good web resources. I knew I was querying high fantasy so that narrowed it down a bit. I’d be happy to tell you what I can! Feel free to send me an email – pedlimwen@gmail.com.